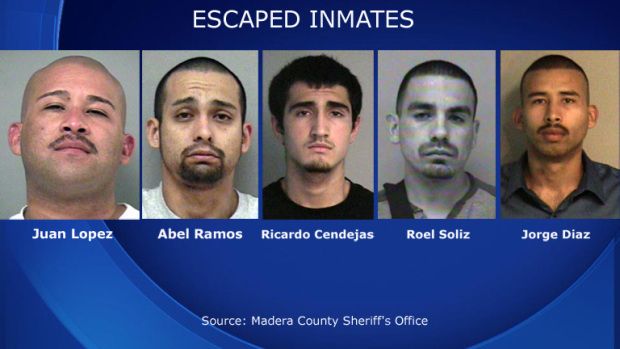 MADERA, Calif. - Authorities in Central California are on the hunt for five inmates who have escaped a correctional facility. Madera County Sheriff's spokeswoman Erica Stuart says the inmates broke out of the Madera County jail late Friday night. Authorities are looking for 33-year-old Juan Lopez, 26-year-old Jorge Lopez-Diaz, 25-year-old Abel Ramos, 19-year-old Ricardo Cendejas, all of Madera; and 29-year-old Roel Soliz of Chowchilla. The men were being held in custody on various charges including attempted murder and armed robbery. Stuart says it is unclear how the men, who are believed to be gang members, escaped from the jail. She says the men were last seen wearing either orange jumpsuits or white T- shirts with blue shorts and jail-issued sandals. Authorities say all five men should be considered armed and dangerous.